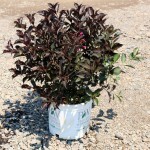 A compact shrub with dark burgundy foliage. The spring flowers are brilliant rosy-pink, making for a striking combination. Attractive to hummingbirds, and flowers hold up surprisingly well when cut for a vase. 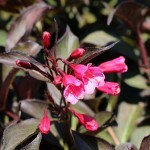 Grows best in full sun in an average, well-drained soil. Prune for shape after flowering. PP 10,772.